1. Wash the green chillies. Make a slit and remove the seeds. 2. Combine gram flour, ajwain, cumin powder, mango powder, asafoetida and salt. Mix well. Add water and make semi thin batter. Let it rest for 30 minutes. 3. Heat oil in a frying pan. Dip the chillies in batter and drop into the oil. Deep fry by rotating all the sides till it turns golden brown in medium heat. 4. Remove from oil and place it on paper towel. 5. 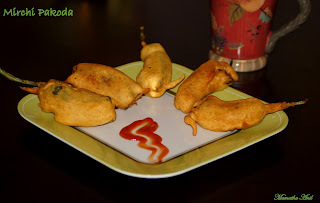 Mirchi pakoda is ready to serve with hot coffee or tea.